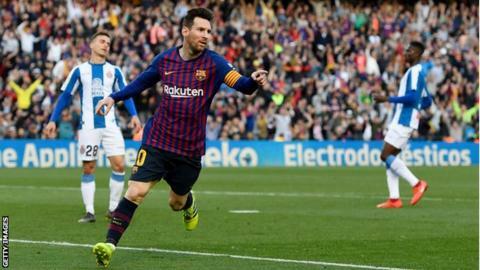 Lionel Messi scored twice in the second half, including a chipped free-kick, as Barcelona beat Espanyol to keep their 10-point lead at the top of La Liga. Messi dinked his first goal from the edge of the box, with Espanyol defender Victor Sanchez failing to head clear as he ran back towards the goalline. The Argentine finished off a counter-attack late on to take his tally to 31 goals for the season. Second-placed Atletico Madrid thrashed Alaves 4-0 later on Saturday. Saul Niguez and Diego Costa scored in the first half and Alvaro Morata and Thomas Partey added two more for Diego Simeone's side in the second period. Messi has scored 22 goals in his past 15 Spanish top-flight games, while he has also surpassed 40 goals for the 10th season in a row. He had been an injury doubt for Saturday's game after missing Argentina's friendly against Morocco in midweek, but showed no ill effects when he had the hosts' first chance of the match, only to see his shot deflected over the crossbar. Barca - who face Manchester United in the Champions League quarter-finals - dominated the first half, with Ivan Rakitic and Luis Suarez both going close to breaking the deadlock, and it was not until the second half that goalkeeper Marc-Andre ter Stegen was first troubled, by Oscar Melendo. Messi's opener saw Espanyol's Sanchez substituted soon after, before the forward sealed the three points by slotting home a Malcom cross.